Featuring high capacity “eneloop pro” and safer “eneloop plus”! Tokyo, June 9, 2011 – SANYO Electric Co., Ltd. (SANYO), a world leader in rechargeable battery technology, is pleased to announce the new additions to line-up of the eneloop rechargeable battery series, the “eneloop pro”, the “eneloop plus” and their charger sets to be released for the Japanese market. The new “eneloop pro” battery has a 25% higher capacity than regular eneloop batteries, making it especially suitable for gadgets with high power consumption, such as digital cameras, strobe lights and flashlights etc. The new “eneloop plus” battery, with its overheat prevention function which suppresses overheating in case of improper use, is ideal for toys. In addition, SANYO will also launch the “Wireless Charging Carrying Case” which can wirelessly recharge eneloop batteries. The carrying case is compliant with ‘Qi’, a standard of the Wireless Power Consortium (WPC) who are working towards the international standardization of wireless recharging technologies. 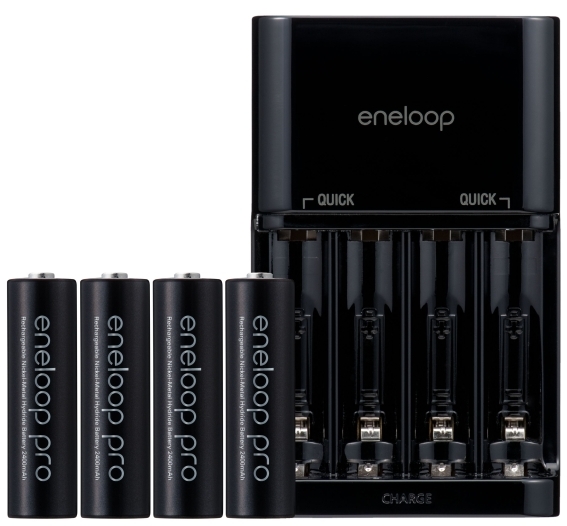 The “eneloop pro” will be available from July 21, 2011 and the “eneloop pro” charger set will go on sale from September 21 in Japan only. The “eneloop plus” and its charger set will be available from December 1, 2011, also in Japan only. 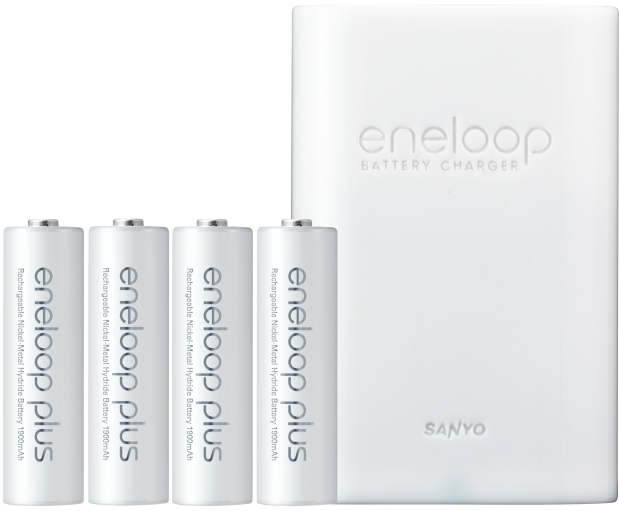 SANYO, as a member of the Panasonic Group, will continue to expand the “eneloop” series throughout the world so that people can comfortably adopt a new "lifestyle that values reusing and recycling". Approximately 25% higher capacity than regular eneloop batteries. The new addition to the line-up, the “eneloop pro” rechargeable battery with Min. 2400mAh, has a 25% higher capacity than the regular eneloop battery with Min. 1900mAh. This means that the battery has a longer life than the eneloop and is more suitable for professional use of digital cameras, strobe lights and flashlights etc. In accordance with the “Green Power Certification System,” the “eneloop pro” batteries are charged by “Green Power” from photovoltaic generation. A part of the electric power used for manufacturing “eneloop pro” batteries (the amount equivalent to that used for factory pre-charging) is generated using clean, renewable solar energy, part of SANYO’s initiative to realize a “Clean Energy Loop,” where power is generated from renewable energy sources, stored for use when needed in batteries, and conserved or used efficiently. With overheat prevention function for increased safety in case of improper use. Suitable especially for toys. The “eneloop plus” battery houses a PTC thermistor which suppresses overheating in case of improper use, such as incorrect insertion of batteries, and is safer to use for toys for small children. In accordance with the “Green Power Certification System,” the “eneloop plus” batteries are also charged by “Green Power” from photovoltaic generation. Wirelessly recharge AA and AAA-size eneloop batteries. Compliant with ‘Qi’, an international standard for wireless recharging technology. 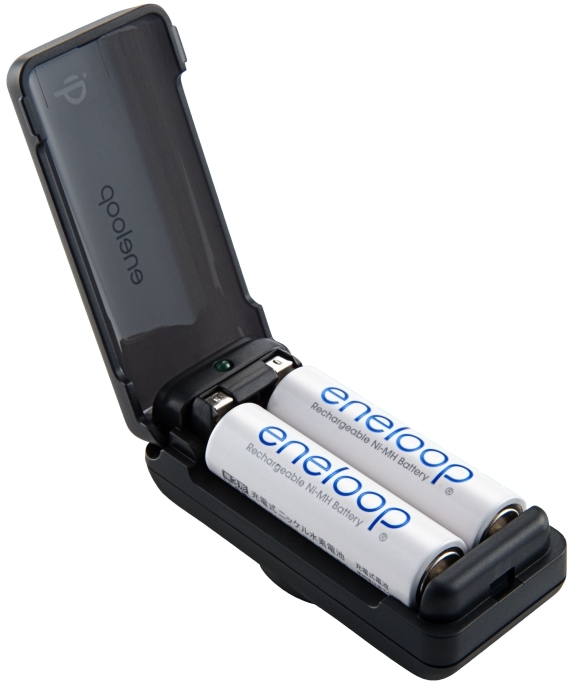 The Wireless Charging Carrying Case can speedily and wirelessly charge the eneloop series batteries (AA and AAA-size eneloop, AA and AAA-size eneloop lite, AA-size eneloop pro as well as AA-size eneloop plus) by simply placing it on a charging pad which is complaint with “Qi” standards. The compact body is easy to carry around, and also prevents electrical shorts. “Qi” is an international standard of the WPC, and Panasonic Group, a regular member of the WPC, has been participating in the standardization since the foundation of the WPC. The “eneloop” battery has received high market appraisal for its unique, user-friendly combination of having the advantages of both dry cell and rechargeable batteries. The batteries come pre-charged like a dry cell, and are economical and environmental as they are able to be recharged for repeated use as well as recyclable at the end of their lifecycle. According to a company survey, the satisfaction level of “eneloop” users is over 90%, and numerous companies now bundle “eneloop” batteries with their products. In total, over 170 million “eneloop” battery cells have been shipped to more than 60 countries worldwide (as of May 2011).